Dar es Salaam, Tanzania – The role of innovation as a driving force of social, economic, and environmental development is one of the central themes in post-2015 global development agenda discussions. In a ministerial-level meeting with guidance from the World Intellectual Property Organization last week, African policymakers outlined what they would need to foster innovation at home. Among a list of recommendations, ministers widely agreed on the importance of developing national intellectual property frameworks, capacity building, and raising awareness through education. Encouraging the use of IP flexibilities, however, was largely left out of the conversation. 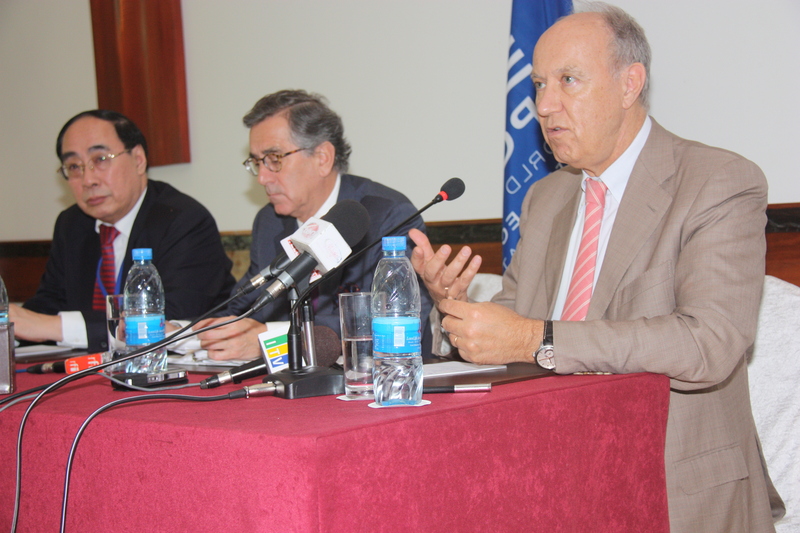 The UN Economic and Social Council (ECOSOC), a body responsible for 70 percent of spending across the UN system, held the Regional Preparatory Meeting for Africa on 14 March in Dar es Salaam. Recommendations from this meeting, along with other regional preparatory meetings, will be taken into account at ECOSOC’s Annual Ministerial Review, which will be held from 1-4 July in Geneva. This was the first time that an ECOSOC Regional Preparatory Meeting was co-organised by the World Intellectual Property Organisation (WIPO). The Japan Patent Office was also a meeting organiser, with support from the government of Tanzania, and in cooperation with the United Nations Economic Commission for Africa (UNECA), and the United Nations Department of Economic and Social Affairs (UNDESA). In line with ECOSOC’s theme this year on “Science, Technology, and Innovation for Sustainable Development,” the African regional meeting focused on how innovation can enable achievement of the Millennium Development Goals and sustainable development. He emphasised the role of countries in driving their own development during a press conference. Referencing the global economic crisis, he said that given the “difficulties developed countries are facing,” their ability to “finance development” could be reduced. Developing regional and national intellectual property policies was a key part of the ECOSOC discussions, overlapping the theme of a WIPO conference held over the previous two days (IPW, Developing Country Policy, 12 March 2013). Many of the technology, industry, science, and justice ministers in attendance participated in both events. Several examples of national and regional frameworks were discussed during the one-day event, with some of Kenya’s recent policies and initiatives supporting science, technology and innovation highlighted as an example. During one of her interventions, Margaret Kamar, minister for higher education, science and technology in Kenya, pointed to the nascent establishment of the Kenyan National Innovation Agency. For Kamar, enhancing IP public awareness through education should be a priority, a message that was included in the meeting’s key messages to be conveyed during the ECOSOC meeting in July. A complete list of agreed priorities are included in the meeting press release. “I really believe that intellectual property should be part of schooling, even primary school, let it be a way of life. To know that your knowledge is not just for free, you can also add something, and if you discover something, it’s for you. If we allow this to be learned when students are very young, it will be easier for them to hold onto it, and be able to exploit it,” Kamar told Intellectual Property Watch. Similarly, Jacqueline Mneney Maleko, director general of Tanzanian’s Trade Development Authority, told Intellectual Property Watch that although a national IP policy is in its advanced stages of development, public awareness if very low. “The challenge we have is to know how to exploit intellectual property for economic growth and for growth of our businesses,” she said. “In our country, entrepreneur culture is still very low, the culture is just creeping in. We have a lot of entrepreneurs, but most of the entrepreneurs are not there by virtue of really wanting to be entrepreneurs, it is mostly for lack of formal employment. Above all, most of our entrepreneurs are from the informal sector,” Maleko said. In the context of implementing intellectual property policies as part of the promotion of an innovation ecosystem, several meeting participants mentioned capacity building as a key challenge. A new working paper commissioned by WIPO, entitled, “Innovation and IP in Africa: The Role of IP in Supporting the Objectives of Fostering Science Technology and Innovation for Africa’s development,” takes stock of the innovation landscape across the continent, points to some of the innovation gaps, and makes recommendations on improving the situation. Authors Getachew Mengistie, IP consultant and attorney from Ethiopia, and Barthélemy Nyasse, professor of Medicinal Chemistry at the University of Yaoundé in Cameroon, presented their findings for the first time during the WIPO conference on 13 March. A paper backgrounder was made available, but the full publication has not yet been released. Through a review of the literature and available statistics, the authors underlined the dearth of intellectual property coming out of Africa. According to INSEAD and WIPO’s Global Innovation Index 2012, with the exception of Mauritius and South Africa, African innovation index rankings are very low, with an average score of some 26 out of 100 points. In terms of IP title filings in 2010, Africa ranked last across all categories. “Looking at these results, we asked why Africa is performing so poorly in the production of science and technology. Is it because IP is bad for Africa?” Nyasse told Intellectual Property Watch. “Other countries, such as Japan, have used IP to develop, by using existing technology but developing strong trademarks, such as Toyota and Sony. India has developed using IP by using patent data and reverse engineering to become leaders in the production of generic medicines. If IP has allowed other countries to progress, why hasn’t it allowed, or why is Africa not exploiting certain aspects of IP?” Nyasse said. According to the paper, one of the major obstacles is the lack of regulations, policies, and institutions to encourage and support researchers and entrepreneurs in pursuing intellectual property protection of their work. It recommends creating policies and structures where they don’t currently exist. The use of IP flexibilities in Africa today and going forward was not an area of focus during the ministerial meeting. Under the World Trade Organization Agreement on Trade-Related Aspects of Intellectual Property Rights (TRIPS), developing countries negotiated flexibilities to enforcing IP rights when it was not in their national interest, such as in the case of needed medicines. Developed countries have worked for years to discourage use of these flexibilities. Although the use of TRIPS flexibilities is a key development issue in Africa, this issue was not an agenda topic, nor was it discussed in the publication summary on innovation and IP in Africa prepared for the meeting. However, Nyasse stressed that the paper in no way suggests the strengthening of IP laws or enforcement. "African Ministers Focus On IP Role In Innovation For Development; Less On Flexibilities" by Intellectual Property Watch is licensed under a Creative Commons Attribution-NonCommercial-ShareAlike 4.0 International License.